a report received from the Police on figures of crime that had been committed in the Haslington/Winterley area recently. They were reports of one burglary 2 thefts and 2 assaults. Our new PCSO is Lizzy Jolley and can be contacted on 0845 458 6370. On a Speedwatch recently there was one registered speeding from Doncaster and one also from Wiltshire, as well as local vehicles speeding. It was reported that four extra people have joined the Speedwatch Team and has support from Lizzey Jolley. A problem was reported about the coach from Reaseheath parking in the bus stop adjacent to the Village Green and impeding the local buses from being about to use the pull in. Also, it was reported that more HGVs are using the village especially M&S lorries and the Clerk was to write to the relevant people. There were still problems with potholes all over the village and more recently at Slaughter Hill. Cheshire East Highways say that they are doing the best they can in the present weather circumstances. The light that had been removed from the Dingle and had been reported at least three times had still not been replaced. Now that the nights are dark this is posing a very real problem. There is an online survey on the Playground equipment to be installed in the near future, This can be found on the Haslington Facebook or Haslington.org website. The puffin crossing is to be completed immediately. 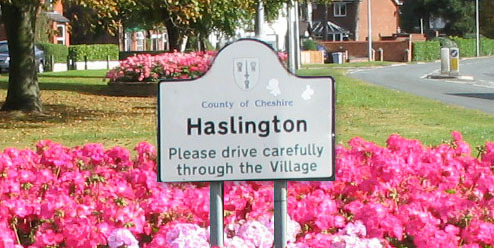 There had been a meeting with representatives of the WI and Haslington Parish Council regarding the installation of a bench on the Village Green. Also, the WI wished to plant two trees either side of the bench and a bed of snowdrop and crocus bulbs by the bench. They wished to put these on the verge of the Village Green so as not to impede the mowing and any events that would take place over the whole of the Green. It was agreed that this could take place. The Yoxhall is in crisis as the committee is lacking the number of members needed to run the Hall. A Chairman, Treasurer and Booking Clerk are needed as the members holding these posts will resign from the committee at the AGM to be held in November. If anyone is willing to take on these roles or would like to be a member of the Yoxhall Committee please contact Geoff Beadle on geoffbeadle17@gmail.com. The William Dykes memorial street sign is to be put in place on 14 April. This will be accompanied by standard bearers from the Royal Welsh Fusiliers and a short dedication service by Councillor George Wood. This is to commemorate the 100 years of William Dykes and will take place at The Croft. Complaints have been received about the unnecessary closure of lanes at the Crewe Green roundabout and the lack of work being carried out. There is an ongoing litter problem by the Skate Park and users are to be urged to dispose of their litter appropriately. The Dingle School sign off Crewe Road is missing; the Clerk is write to the appropriate authorities on this matter. If anyone would like a full report of the March meeting can they please ring the Clerk, Mrs Joan Adams, on 568760. This will be issued after the April meeting to be held on 9 April 2018.